CiraSync is possibly the only contact synchronization service for Office 365 that lets you sync and merge contacts from several different source locations. You can sync contacts from the Global Address List, Public Folders and shared mailboxes all combined together into a single target folder. It is a smart merge — it doesn’t simply add all contacts to make one great big target folder. It looks for contacts with the same email address and does a field level merge of the contacts. Below are two examples and an explanation of how CiraSync contact merging works. Let’s assume that the Office 365 GAL is up to date with employee business phone number, title and business address. 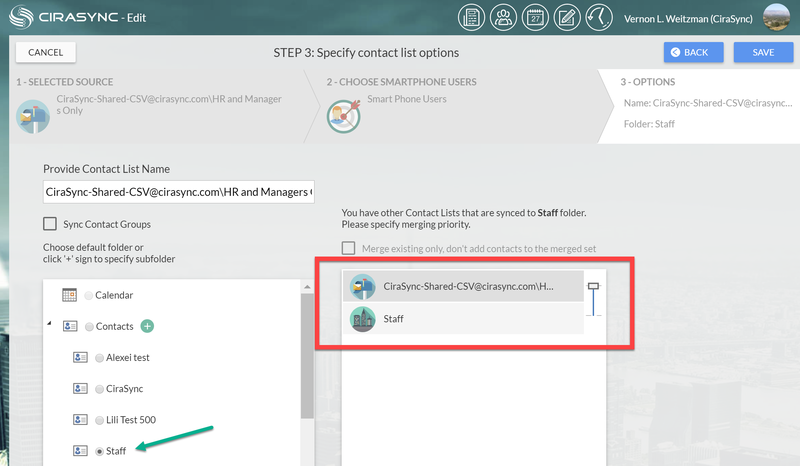 With CiraSync, you can figure a sync operation to push this Staff Contact List to every smartphone user in your Office 365 tenant. It literally takes just a minute setup and kick off a background sync task to hundreds of users in your tenant. Now the HR Manager says that she also wants to push ICE information — spouse, Home phone and Home address to all first line managers and above. HR has published all of these Home Address Details in a Shared Mailbox which has the HR Managers contact folder. In this case we will have two contact lists that target the exact same contact subfolder. With CiraSync, you would setup a second sync operation from the shared mailbox, but this time to a Distribution Group called ALL Managers . CiraSync will merge the GAL and shared contact folder to every manager. In the case of adding ICE information the HR Manager created a folder that contained information with completely different fields that were to be cleanly added to GAL contacts. Let’s look at a different example of syncing two folders where there is more likely to be conflicts. In this example, we have two public folders. The first is a contact list that has customers and sales prospects. The second is a handy vendor list that most of the smartphone users need. Both contact folders are synced to the default contacts folder in every mailbox (of users that have a smartphone). Our example contact is John Smith at Acme123. He happens to be both a customer and a vendor so his contact exists in each folder respectively. However, the two contacts were created by different people at different times. CiraSync will merge all fields of both contacts into a single contact in each user’s target folder. For example, if there is a business address in the Customers folder but no business address in the vendors folder, the target contact would merge all fields and have the best available business address. Because there is a conflict for business phone, CiraSync doesn’t know which source has the correct phone number. Perhaps if your company is much more concerned about maintaining accurate customer profiles, you trust the customer contacts more than you trust the vendor contacts. In that case you would tell CiraSync to prioritize the Customers contact folder at a higher priority so that if there was a conflict, the specific fields in the Customers folder will be written to the target contact in each users mailbox. In the example above, [email protected] would be written to each user with a business phone of 303-555-1234. Note also that the Vendors folder only had an initial for Smith but in the final merged result, each user would see John as the first name. Note that if all of your source contact lists come from the GAL, the merging would not have any effect since there is only a single instance of each entry in the GAL.